One of the things I love about summer is all the lovely berries that are around at this time of year. My favourites are raspberries and blueberries. I enjoy making raspberry jam, using the berries in puddings and muffins and cakes, or adding them to cereal for breakfast. I picked the first of our blueberries yesterday! We have two blueberry bushes, which usually provide us with enough berries for the summer, as well as some for the freezer. One of my favourite recipes is one that Mum used to make when we were kids. She would bake all her own cakes and biscuits, and we would always have yummy things to eat when we got home from school. Although this recipe is made with raspberry jam, you can use any jam. Sometimes I make it with homemade plum jam, which is just as nice. Sift the flour and baking powder into a bowl, then stir in the caster sugar. Rub in the butter until mixture resembles breadcrumbs. Beat the egg and mix in lightly so the mixture is still crumbly. Divide the mixture in half and press half the mixture firmly into the base of a greased or baking paper-lined tin. Mix the cinnamon and jam together and spread over the base. Spread the rest of the crumbs over the jam, leaving the texture rough. Bake at 180ºC for half an hour. Cool in the tin, then cut into squares. This entry was posted in Recipes and tagged berries, food, nostalgia, raspberries, raspberry crumble slice, recipe. Bookmark the permalink. 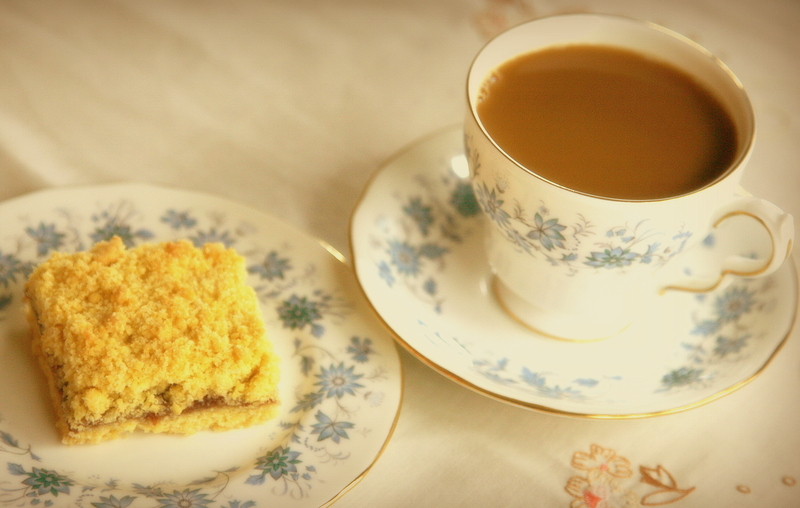 I really enjoy reading Kristah’s blog and my eyes lit up when I saw she had baked this very old fashioned favourite – a slice I haven’t experienced since my childhood. Thanks for letting me reblog your recipe Kristah. I notice you often like my posts and I want to thank you for reading them. I was wondering if you would mind my reblogging this recipe for Raspberry Crumble Slice on my blog? Hi Andie, I enjoy reading your blog. I’m happy for you to reblog the recipe. P.S. I am also a Kiwi. Is it able to be frozen? I’ve never tried freezing it, but I am sure it would freeze well. I will make this one. I remember it as a child and want my boys to experience it. Thanks! It is one of my favourite recipes. It is an oldie, but a goodie! This sounds fabulous! I can’t wait to give it a try. And it will give the girls and I practice with the measurement conversions, too. 🙂 We often have wild blackberries growing in our area but my favorite berries are blueberries. I’d love to start a couple of plants here in the near future. I was thinking about it a few days ago, in fact! I hope you try it! It is an easy, but delicious recipe to make. I love being able to go outside in the summer and pick fresh blueberries. I would like to have a go at growing raspberries sometime. The trouble is finding space in our small garden!